Tropical Storm Lionrock was east of Kyushu, the southwestern-most of Japan's main islands while Tropical Storm Mindulle was southeast of Toyko when NASA-NOAA's Suomi NPP satellite passed overheard on Aug. 21. The storms are each headed in different directions. On Aug. 21 at 11:45 p.m. EDT (0345 UTC on Aug. 22) the Visible Infrared Imaging Radiometer Suite (VIIRS) instrument aboard NASA-NOAA's Suomi NPP satellite captured a visible light image of Tropical Storms Lionrock and Mindulle. The VIIRS image showed that wind shear has relaxed on both storms as they appeared more circular than they did the previous day. Since the Suomi-NPP image, Lionrock continued to move further southwest and away from Japan's Kyushu Island and Mindulle made landfall just south of Toyko and now moved north of the city. 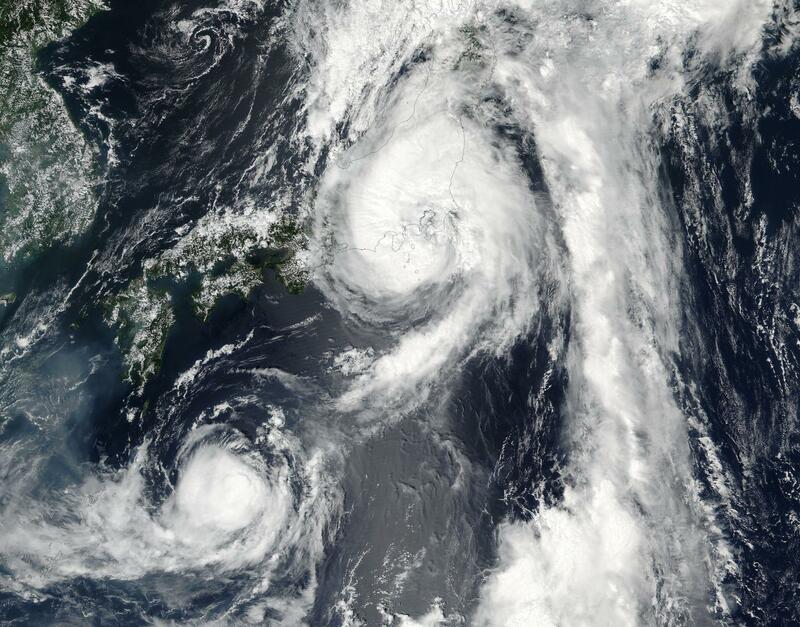 At 11 a.m. EDT (1500 UTC) on August 22, 2016 Tropical Storm Mindulle was centered near 37.9 degrees north latitude and 140.7 degrees east longitude, about 152 nautical miles south of Misawa, Japan. Mindulle has tracked north-northeastward at 23.0 mph (20 knots/37.0 kph) and is expected to continue moving in that direction. Maximum sustained winds were near 46.0 mph (40 knots/74.0 kph). The Joint Typhoon Warning Center forecast calls for Tropical Storm Mindulle to move north across Honshu and Hokkaido while becoming turning extra-tropical. At 11 a.m. EDT (1500 UTC) on August 22, 2016 Tropical Storm Lionrock was centered near 28.4 degrees north latitude and 133.9 degrees east longitude, about 344 nautical miles east-northeast of Kadena Air Base, Okinawa, Japan. Lionrock has tracked south-southeastward at 3.4 mph (3 knots/5.5 kph) and is expected to turn to the southwest and curve north while strenghtening. Maximum sustained winds were near 40 mph (35 knots/62 kph). Lionrock is expected to pass just east of the island of Minami Daito Jima, Japan on Aug. 24 and then strengthen into a typhoon as it turns north.